DETROIT (Reuters) - Ford Motor Co's new chief executive, Mark Fields, is giving the automaker's long-moribund Lincoln brand what his predecessor Alan Mulally never could: a little love and a lot of cash. Lincoln, a storied Detroit brand which Ford has owned since 1922, has been in a swoon for the past two decades, leaving dealers and customers wondering if Ford management had left the brand for dead. Now, with the renewed backing of Executive Chairman Bill Ford and the company's board, Fields has committed the automaker to a multiyear, multibillion-dollar overhaul of Lincoln that includes a significant investment in a new premium vehicle platform that will underpin several future Lincoln vehicles, four sources told Reuters. Ford could spend $5 billion or more over the next five years to revive Lincoln, revamp its product portfolio and reposition it as a true competitor to such global luxury leaders as Daimler AG's Mercedes-Benz and BMW AG , the sources said. Details of the new platform and the size and scope of the investment have not previously been reported. "It's really important for us to have a relevant and vibrant luxury brand," Fields told Reuters on Friday. "You need to make the investment and build this brand over time." He declined to discuss details about Ford's spending and product plans. Fields said Ford is looking at the Lincoln rebuilding effort "in terms of generations of products," an effort that will stretch well into the next decade. Ford executives said last month that the immediate goal of the latest Lincoln turnaround effort is to triple the brand's global sales to 300,000 vehicles by 2020. Several industry analysts have challenged that mark as overly optimistic, as have some former Ford executives who spoke with Reuters on condition of anonymity. A longer-range target is to restore Lincoln's luster as a premium automotive marque in the United States and build it into a formidable competitor in China, where Ford is just now launching the brand years after most of its global luxury rivals entered the China market. On Friday, Ford delivered its first Lincoln in China, an MKZ sedan. The springboard for the Lincoln revival plan is a new family of vehicles that will be built on a highly flexible premium platform that can be configured for front-, rear- and all-wheel-drive vehicles, according to industry sources familiar with Ford's plans. That is a critical element that has been lacking in several previous, under-financed attempts to resuscitate the brand. Versions of the platform will be used by both the Lincoln and Ford brands, the sources said. Former CEO Mulally, who stepped down in July, declined to make more than a nominal investment in Lincoln - and even considered selling or closing the brand, according to two sources. But his successor, Fields, has directed his management team to try to reverse a long-term U.S. sales skid that has seen Lincoln sink from the No. 1 spot in 1998 to eighth place among luxury brands, with about half the sales of General Motors Co's Cadillac and one-quarter the sales of segment leader Mercedes. Last year, Lincoln sales were 81,694, less than half of the 187,121 cars it sold in 1998. The revival effort is backed by the first significant investment in Lincoln in years, one that will see every product redesigned or replaced over the next five years. Ford already has spent about $2 billion on Lincoln in the past two years, according to one source, about half of that to prepare for the brand's introduction this week in China and half to update and expand its product stable to tide Lincoln over until the new family of vehicles is ready toward the end of the decade. Ford has said in some years it spent only $500 million or less on Lincoln. In September, the automaker told investors it plans to spend more than $2.5 billion through 2019 on Lincoln product development, facilities and tooling. But that figure does not include spending on engineering, advertising and other sales-related expenses for Lincoln, Chief Financial Officer Bob Shanks told Reuters on Friday. Much of the new investment is earmarked for development and tooling of the new premium platform, known internally as D6, sources said. The development is being overseen by new Lincoln President Kumar Galhotra, an engineer. The flexible architecture of the D6 will provide the mechanical base for a wide variety of sedans and crossovers starting in 2019, all designed to give Lincoln more differentiation from its Ford-branded siblings, as well as a stronger foundation on which to build more competitive luxury models to pit against the sector leaders. Before the first of the new D6-based models arrive, Lincoln will update most of its existing products, starting with a redesigned MKX midsize crossover in spring 2015 and a replacement for the MKS large sedan in spring 2016, sources said. The latter model will include a long-wheelbase version with more room inside for Chinese customers, Galhotra said. The Navigator full size utility vehicle is slated for an extensive overhaul in autumn 2017, according to sources, when it will share a version of the new Ford F-150 chassis and will get aluminum body panels. A redesign of the compact MKC crossover is tentatively scheduled in autumn 2018, the sources said. The first of the all-new D6 models, due in 2019, are a midsize sedan that could replace the MKZ and a large seven-passenger crossover that could replace the MKT, sources said. Both new models are expected to be offered in front- and all-wheel-drive versions. I think it would be the Lincoln Mark IX; and hell yea that would be cool. Or they could skip over 9 and go straight to Windows 10 like Microsoft did to keep up numerically with Apple OS X. Last edited by Trunk Monkey; 10-25-2014 at 05:08 PM. How about starting with dropping the stupid alphabet soup MK_ names? We had a meeting at work, and "MK-s" was mentioned - I needed clarification, was that "xray" or "Sam"
Yes, continental, town car, etc would really help. IMO this is the wrong direction for Lincoln. Cadillac and Buick have China (cause they are seen as big wasteful American sedans--status symbol). I feel Lincoln needs a V12 Sedan and Coupe, if for nothing more status and shock and awe. With possible I-6s too. Both for NVH. Marketed for luxury and refinement mainly, with a little bit of flare here and there. Lincoln need to be CLEARLY different form Ford, IMO volume won't do it. Most people can see past badge engineering and this all I see this as being. Caddy went for BMW and is doing a decent job at it; Lincoln should by pass them and either go for Mercedes or Jag/Aston, or at the very least Audi. * Audi has the economies of scale from VW. * Mercedes has a wide swath of vehicles and they themselves are going downmarket (see: CLA). If I had to guess, Audi/Mercedes are the clear targets of this re-investment in Lincoln. Positioning Lincoln as a Jag competitor would fit your idea of making a smaller number of premium luxury vehicles. After all, this is what Jag is seeming to be doing since they have actually designed some exciting vehicles recently post-TATA acquisition (see new F-Type). The big question will be to see how many F-types and other "new" Jags you actually see on the streets (at least in CA, where there are $$$ to buy those cars if the desire exists). Personally, despite the F-type having started shipping in March, I can't recall having seen more than 1 or 2 on the streets. For the amount of money Ford is bantering about investing, aiming for Jag might be aiming "too low." That's where I was going with that statement, there have a been a number of filler cars after the Mark VIII, so I doubt they would make a IX. How about a high-performance RWD luxury coupe? How about RWD, period? They've had their shot three times now to do something intelligent (MN12, DEW98, S550) and they haven't followed through. There's so much rich history in Lincoln, they've gotta quit being Lexus or Acura or Mercedes Benz. Build the Lincoln version of this. A vehicle that gives no sh|ts about being anything other than the brand it represents. It wont sell very many but thats not the point, it gets people in showroom and as a result, asses in seats of more mundane models within a modular architecture. Until then, nobody cares. 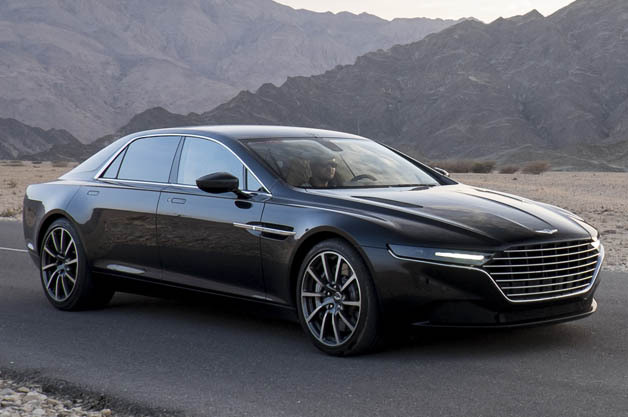 I don't understand the C-pillar treatment on this Lagonda concept. I'm not saying they should copy Aston Martin vehicles. I'm saying they should copy their attitude. AM has built a vehicle that's not conventionally attractive but true to their brand history and values. It ends up being gorgeous. The Thunderbird is more difficult to define, but I'd like to believe that Tony Kuchta found the correct blend of sport and touring, which was kind of a pendulum throughout the car's history. Lincoln needs to get rid of their current styling and go back to the 1962 Continental for inspiration, which they actually used for the last gen Navigator and MKX. That slab sided luxury look lasted all they way until the 1997 Town Car. Even the front wheel drive Continental (otherwise a nice car) used similar styling themes. As much as I like the Mark VIII, it really was a departure from what Lincoln was. I hadn't seen the original. I had to go find it and play catch up. Should I eat this booger, or throw it out the window?